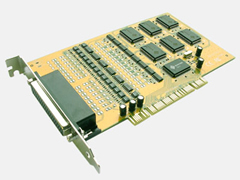 Universal PCI Multi-port serial card provides RS-422/485 Serial connection ports on your system for industrial communication and automation applications. The 8169 card works on both 32-bit and 64-bit PCI Bus with 3.3V or 5V power, allowing this multi-port serial card to be installed in virtually any PC system and compatible with all major operating systems. The card supports multi independent RS-422 or RS-485 ports, with each port transfer data up to 921.6 Kbps and able to control device in a multi-drop mode. ARSC™ (Auto RTS Signal Control) technology provides the best way to make half-duplex RS-485 auto data transmission and receiving without software or writing extra code. In addition, RS-422/485 Auto Identify & Switch technology allows users the convenience of changing between RS-422 and RS-485 devices without jumper or switch setting. Universal PCI Multi-port serial card is the best solution for various industrial communication and automation applications.